petroleum resin, petroleum wax, and natural wax. glass to metal, and metal to metal in making precisidn. glass parts and precision instrument parts. polishing, or dicing of ceramics, silicon wafers, lenses, prisms, etc. KOKONOE SLOT WAXES melt at lower temperature and the lower viscosity of the melts results in a thinner adhesion layer. KOKONOE SLOT WAXES are transparent in a state of thin films. The melts from KOKONOE SLOT WAXES solidify in a shorter Period of time and give a stronger adhesives force. 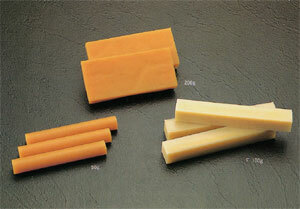 KOKONOE SLOT WAXES are shaped into a round bar form and thus preeminent in work efficiency. Any type of KOKONOE SLOT WAXES is readily soluble in hydrocarbonic solvents.